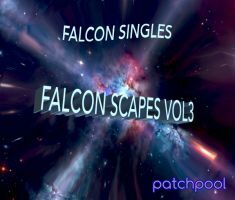 Falcon Scapes Vol3 focusses on long evolving soundscapes and drones, musical beds, wavetable-based pads, sound effects and other electronic sounds. Many of the soundscape samples are several minutes long, often with a distinct tonality, some explore the more experimental, darker side of things. Often granular textures and sample maps are layered with Falcon's internal sound generators creating dense and fascinating sounds usable for a wide variety of genres. Quite a few patches make use of the new features introduced in Falcon version 1.5 (wavetable FM and frequency shifter FX). 62 patches including 1 variation. 3.72 GB GB of samples (116 wavs/stereo/48 kHz/24-bit), 14 background images for the UI and wavetable re-synthesis, 5 impulse responses, 11 wavetables. Library size in total: 3.74 GB. Soundscapes (34 including one variation). The demos below were produced using only patches from Falcon Singles - Falcon Scapes Vol3, no post-processing was applied apart from a limiter on the master output. Also check the demo videos.